Dec 16, 2017; Las Vegas, NV, USA; Boise Broncos quarterback Brett Rypien (4) makes a second half pass against the Oregon Ducks in the 2017 Las Vegas Bowl at Sam Boyd Stadium. 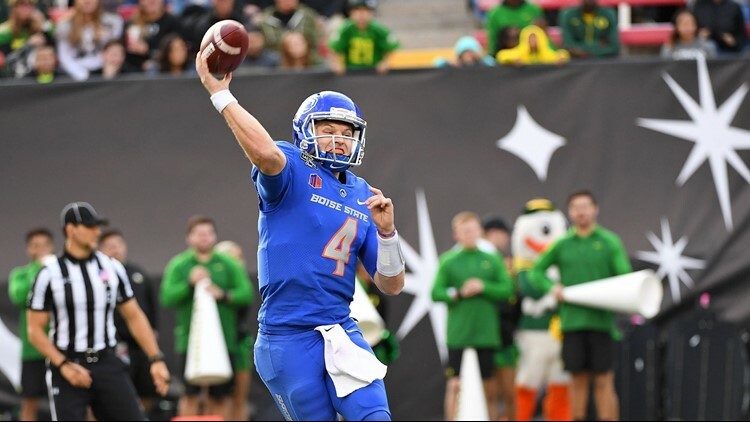 Boise State is 3-0 against Oregon, with its most recent victory at the 2017 Las Vegas Bowl. The Broncos prevailed with a 38-28 thriller. BOISE — Nearly eight months after confetti rained down in Las Vegas, the Broncos and Ducks have agreed to a three-game series. Boise State and Oregon, two of the top programs in college football, have agreed to a three-game future series that will include two games in Eugene and one in Boise. The Broncos will travel to Eugene to face the Ducks on Sept. 14, 2024, and Sept. 5, 2026. The pair will meet in Boise on Sept. 13, 2025. The 2024 matchup will be the fourth meeting between the two and the first since the Broncos defeated the Ducks 38-28 in the Las Vegas Bowl at the conclusion of the 2017 season. Boise State holds a 3-0 edge in the series. Boise State and Oregon will exchange $300,000 for the first two games, then the Broncos will receive $800,000 for the final matchup of the series.